We have hundreds of reasons to resize video files, to upload the recorded graduation or wedding videos to Instagram/Facebook/YouTube, etc, share downloaded feature-length movies, TV shows with friends via Email, free up space for portable devices and more. So, how to get a video in desired size? 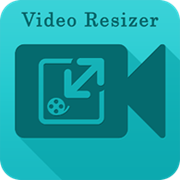 This article will guide you to resize video (MKV, MTS, MP4, AVI etc,) on Windows (10) PC/Mac with an easy-to-use video resizer. • An all-in-one video resizer and editing software helps you resize SD/HD/4K/8K video files (H.265, MKV, MTS, MP4, AVI, WMV, MOV etc,) to obtain a more appropriate size/resolution/aspect ratio for uploading to Instagram, Facebook, YouTube, etc, email sending or other purposes. • It also enables you to download videos from YouTube and similar sites (300+ in total) and resize them for better playback on devices. In order to make video resizing progress much easier, it is quite necessary to get help from video resizers. Experienced users may keep some frequently-used programs in hand, for example Windows Movie Maker, HandBrake, but meanwhile face the limitation of compatible video formats and some unexpected not working errors. 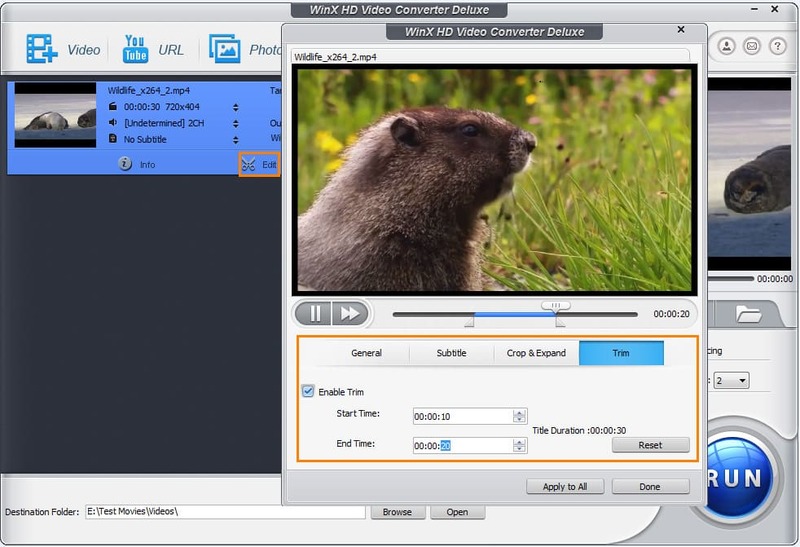 If you want to successfully resize any video files with no effort at all, we highly recommend WinX HD Video Converter Deluxe. Built-in 370+ video/audio codec, this WinX video resizer supports almost all mainstream video formats, including H.265, MKV, MTS, MP4, AVI, WMV, MOV, MPEG, WebM, FLV, 3GP, VOB, HD camcorder formats (MOD, TOD) etc. Especially, it resizes 4K H.264 videos at highest quality. Packed with editing tools and parameter settings, it is available to resize video by trimming/cropping videos or customize video/audio options. 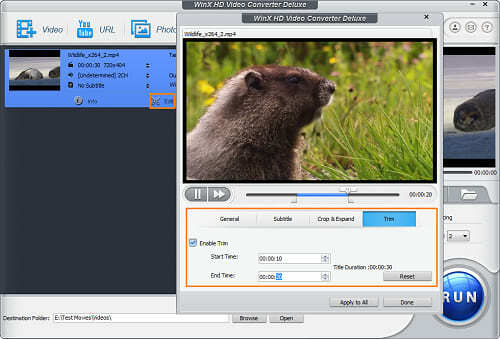 Beyond everything, please DOWNLOAD/install WinX HD Video Converter Deluxe on your Windows (10) PC. It also comes with a Mac version empowering users to resize video on Mac hassle-free. Launch this WinX video resizer and tap +Video button on navigation bar to import the video file you want to resize. In fact, video format/codec plays an important role in video size. Some video formats/codecs like H.265 which supports 8K resolution contributes large size for a file. Therefore, if you want to resize a HD video, it's better to compress the video to a format with compact file size but good quality, like MP4, AVI. If you want to get a smaller video size with plain quality, FLV and 3GP are good choices. After choosing a suitable format, tap the setting button to access to video/audio options. Higher resolution, bit rate and frame rate leads to bigger video size. Adjust those parameters to lower value for video resizing.In addition, if you lower the resolution from 1280x720 for widescreen to 640x480, please change aspect ratio from 16:9 to 4:3 fitting with the resolution. You can also alter audio options to reduce more video file size. Tap Edit button. There are two options allow you to resize video file: Crop and Trim. A part of videos are displayed with black top, bottom or side bars. Select Crop & Expand tab and check Enable crop. Drag the crop letterbox or set position/size manually to remove irrelevant images. And, you can trim a long length video into clips or cut some uninterested contents like film leader and tail, ads embedded in videos etc. Select Trim tab and check Enable Trim. Set Start and End Time by dragging progress bar or inputting the specific value. Tap Browse button to pick destination folder (hard drive or device) and click RUN button to start resizing video. • Free download SD/HD/4K/8K/3D videos in format MP4, FLV, WebM, 3GP from 300+ sites covering YouTube, Facebook, Dailymotion, Vimeo, MTV etc, with original quality. • Convert and compress SD/HD/4K/8K videos to iPhone, iPad, Android, Windows Phone, Surface Pro/Book Xbox, PS3/4 and more with fastest conversion speed. • Create photo slideshow videos (MP4, AVI, WMV, MOV, FLV, MPEG, 3GP etc,) with background music/subtitle from album.